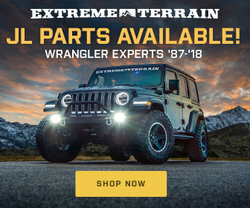 Any owner of a two-door Jeep Wrangler knows that storage inside of your vehicle is always at a premium (some of you JKU owners might feel the same). 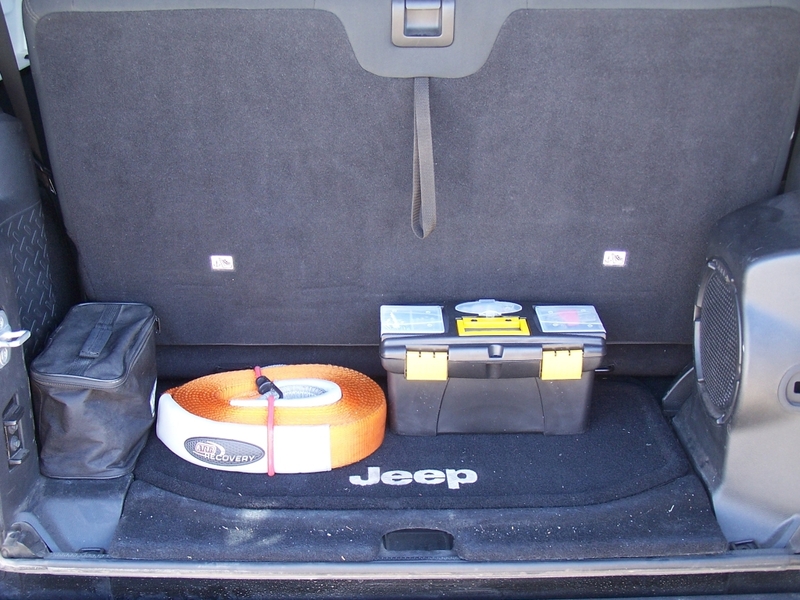 And if you’re anything like me and like to be prepared for unexpected situations, you carry a lot of gear in your jeep. Whenever you go wheeling and especially camping you add even more stuff and quickly run out of room inside your Jeep. You have to be pretty creative and use every available square inch of space. 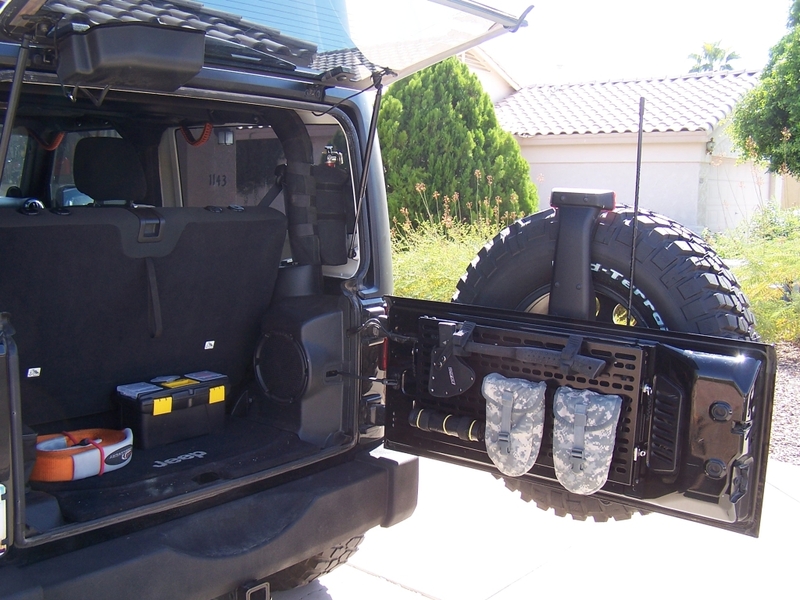 Having a two-door JK myself I’m always looking for smart ways of storing my gear inside my Jeep, that would allow easy access and keep the items secure at the same time. 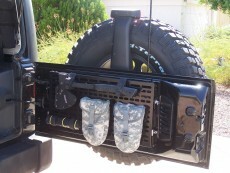 While surfing the web I came across a subject of MOLLE racks, and specifically tailgate racks. 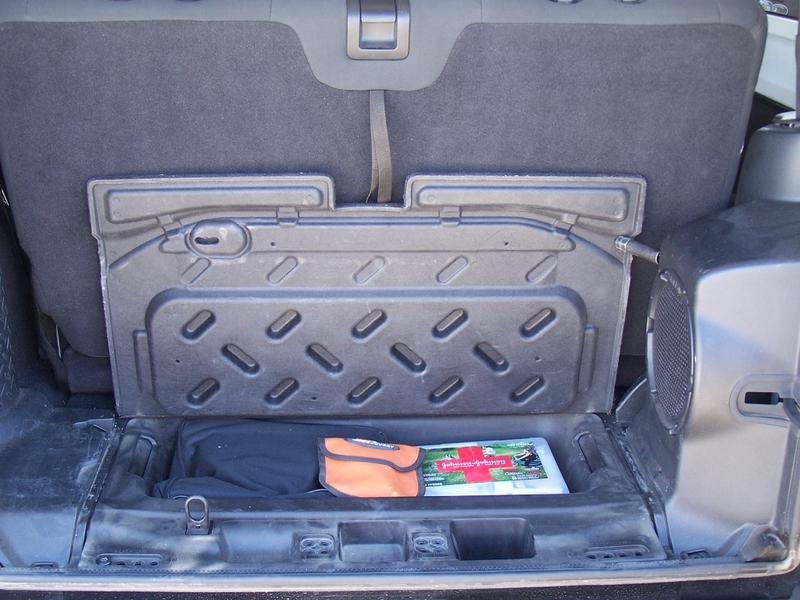 It is such an obvious, great spot for storing gear with incredibly easy access. MOLLE system provides great flexibility and there are so many options when it comes to pouches! As it turns out there are several products that can be attached to the tailgate. It all depends on what your needs are, and of course what you’re willing to spend on the system. You can obviously build a simple panel or rack yourself, and customize it the way you wish. I’m all about DIY projects, but after some calculations I decided that in this case I will save myself time and trouble and pick one of the available products out there. – JK tailgate gear MOLLE panel available on Ebay. 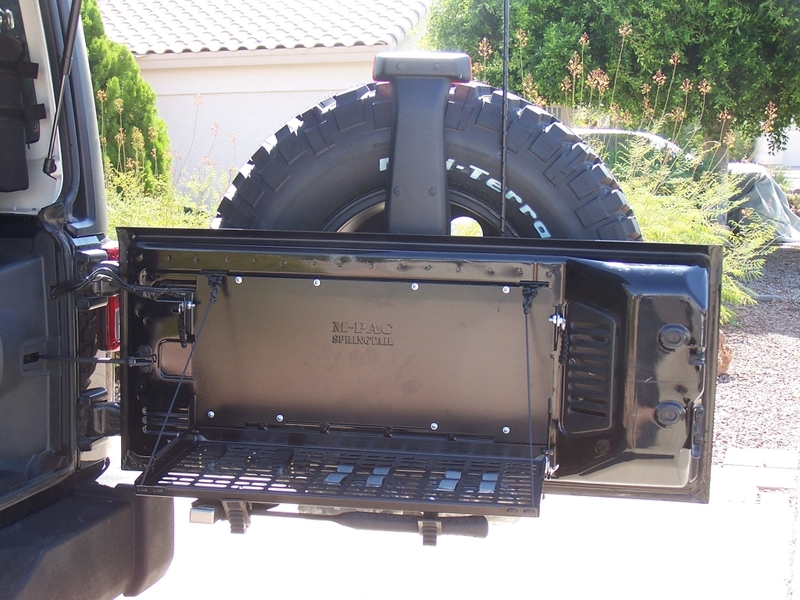 It’s made out of steel, you can customize the design, it requires drilling into your tailgate ($75.00). – Quadratec Tailgate Cargo Shelf. Made out of steel, requires no drilling (around $100.00). – JK tailgate (fold down) MOLLE panel from Ebay. Made out of steel, customizable design, it folds down to a table, requires drilling into your tailgate ($125.00). – Springtail Solutions JK Rear Door Folding Tray/MOLLE Panel. It’s made out of steel, folds down to a table, requires no drilling into your tailgate ($195.00). – Teraflex MP Tailgate Table. The MP table is constructed from lightweight aluminum with stainless steel hardware and is rated for 75 lbs. of evenly distributed load capacity. 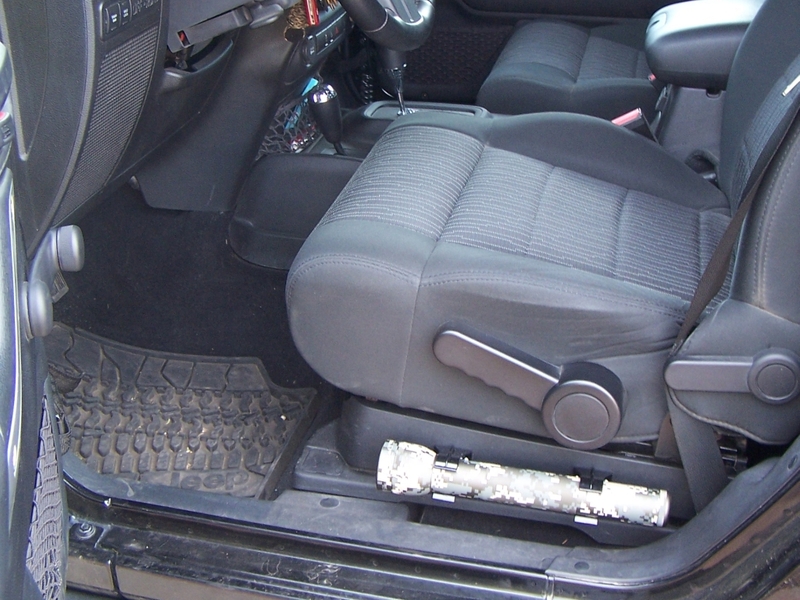 Requires drilling into your tailgate (around $200.00). – The MP Table (Multi-Purpose Table) from Vector Offroad. It’s manufactured from aerospace alloy aluminum, it folds down to a table, requires drilling into your tailgate (around $220.00). There are also few options if you’re looking for a tailgate table only, but for me personally it was very important to have the MOLLE panel to which I could attach gear pouches and clamps. – Rock-Slide Engineering Tailgate Table. Made out of aluminum, requires drilling into your tailgate (around $160.00). – Off Road Evolution EVO Trail Table. Made out of steel, requires drilling into your tailgate (around $180.00). – Outback Adventure Products JK Trailgater with Cutting Board. 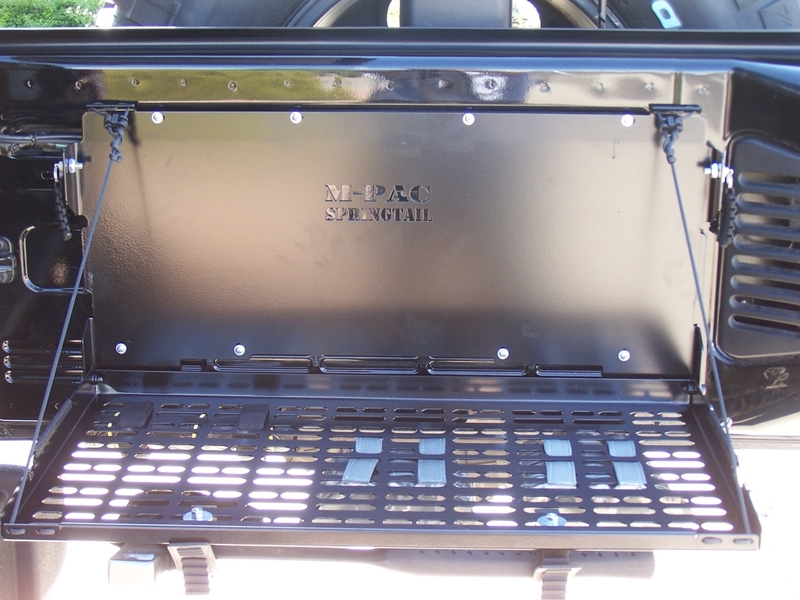 Made out of stainless steel and aluminum, requires no drilling into your tailgate (starts at around $300.00). – Adventure Trailers Trailgater table. Made out of stainless steel and aluminum, requires no drilling into your tailgate (around $330.00). I’m sure there are other products available out there, but that is what I found so far. 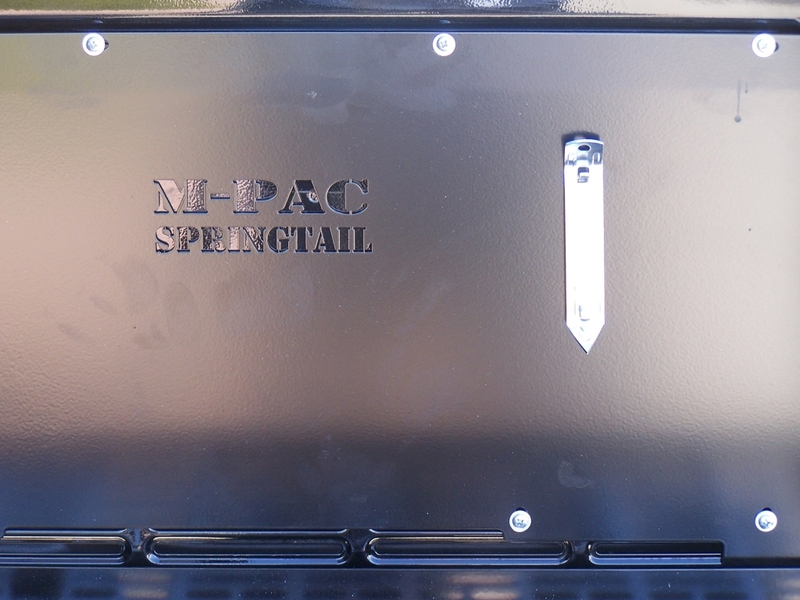 After countless hours of research online I finally decided that I’m going to go with the Springtail Solutions JK Rear Door Folding Tray/MOLLE Panel. It met all my requirements and it seemed to have very good reviews, both regarding quality of the product and customer service. I decided to buy it on Ebay where Springtail Solutions sells several models of their storage systems . I opted for the panel only option since I already had a plan as to what I wanted to install on the panel and did not need any more pouches. The listing delivery info mentions that handling might take more than 10 business days plus of course delivery time. I was very nicely surprised when it turned out that after buying it on Sunday, they shipped it on Monday. The very next day! I received the package on Friday and was ready to install Saturday morning. When I opened the shipping box, I was impressed by the high quality black powder coating on the MPAC grid and laser cut components. It was wrapped well for transit and arrived undamaged. The kit does require assembly, but goes together fairly easily. There is a great video on Youtube that walks you through the installation process. Just take your time and be patient. There are parts you can break if you over tighten them in a rush. The whole assembly takes about 15 minutes even with stops to watch the entire video. 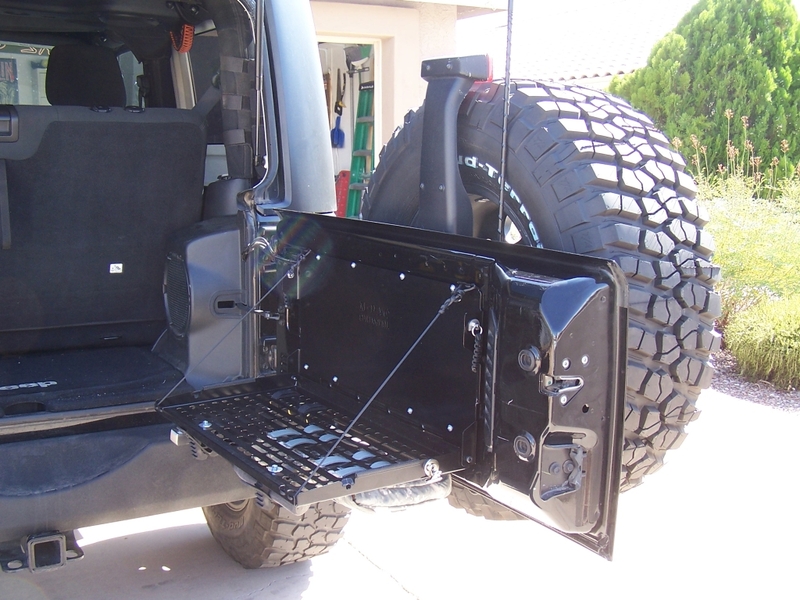 Installation onto the Jeep’s tailgate only takes about 5 minutes once you have the unit fully assembled as one piece, and it doesn’t require drilling and utilizes stock mounting locations. It can also be uninstalled at any point without any trace it was ever there. Don’t get me wrong, I do not plan on selling my jeep EVER, but it is nice when you don’t have to drill into it to add mods. The screws that hold the backing plate to the tailgate seem small, but there are 8 of them and everything feels very secure once tighten. The panel’s size is perfect, included hardware feels very solid, and the operation is smooth. You just pull on the paracord handles attached to the plungers and the table folds down. To fold it up you simply slam it shut. I just wanted to point out that in my case I had to trim the provided weather stripping used to eliminate any rattling of the table. It was just to thick and after removing some excess with a blade everything fitted perfectly. 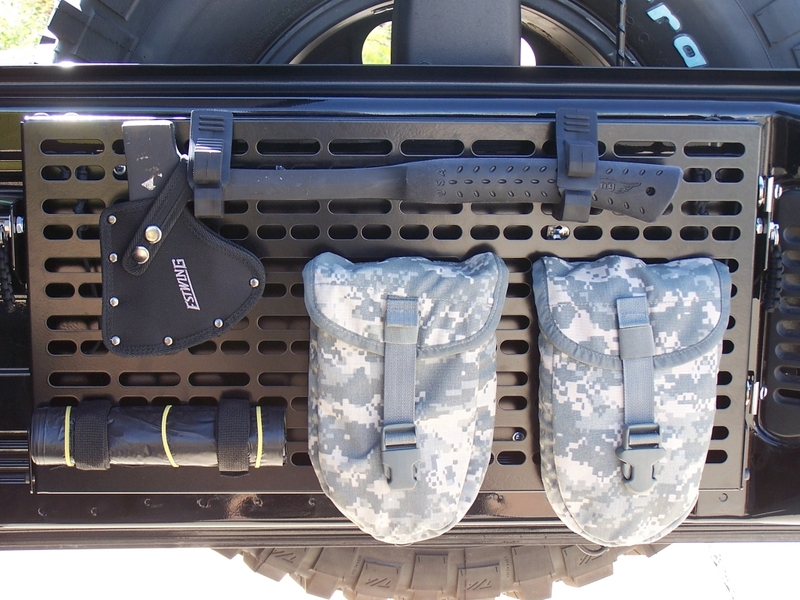 The MOLLE rack gives you plenty of options when it comes to attaching your gear to it. Everyone will have their own ideas. I decided on attaching my camping axe with a couple of Quick Fist clamps , two e-tool carriers (one holds the actual Ames entrenching tool and the other one is for my leather gloves) and some heavy duty trash bags. Just remember that adding too much weight to your tailgate might eventually take a toll on the hinges and the proper operation of the tailgate. I really like the fact that the rack is made out of steel, because it allows me to attach a couple of magnetic clips for my trash bags to the side of it, as well as a bottle opener and have it handy when the need arises. These items attached to the MOLLE rack, together with my fire extinguisher, air compressor, tire deflator, recovery strap, tool box, first aid kit, some roadside assistance items, and my trusty Maglite LED flashlight right by my side, make me feel well prepared and safe. I’ve only had the Springtail Solutions rack/table for a couple of weeks and I haven’t been camping since getting it, but I am really looking forward to taking full advantage of this setup for a very long time! Thanks for this informative article! 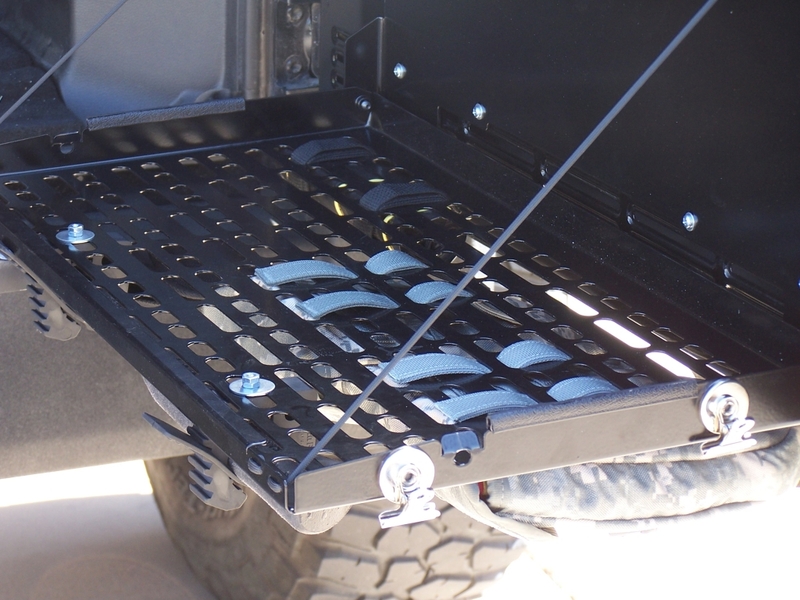 I’ve been wanting to install one of these shelves in my jeep for a while now & this info that you’ve gathered is great!